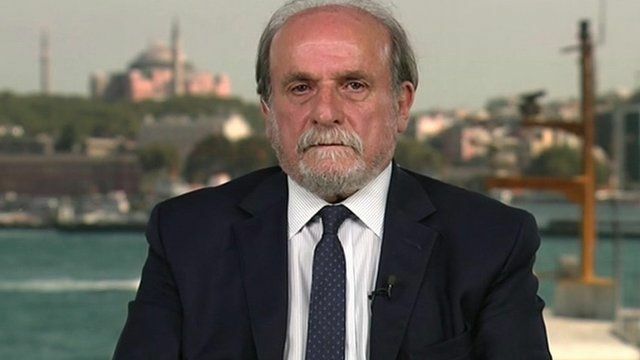 The Turkish government is "tolerating" Islamic State (IS) activities and is only paying "lip service" in the fight against IS, Ertugrul Kurkcu, an MP from the pro-Kurdish party HDP (People's Democratic Party) has told BBC HARDtalk. The Turkish government has persistently denied the accusation. Turkish Foreign Minister Cavusoglu announced US warplanes and drones were arriving at Turkish airbases and will "soon launch a comprehensive battle against Islamic State all together". You can see the interview in full on Thursday 6 August on the BBC World News at 08:30, 14:30 and 19:30 GMT and in the UK on the BBC News Channel at 20:30 BST.